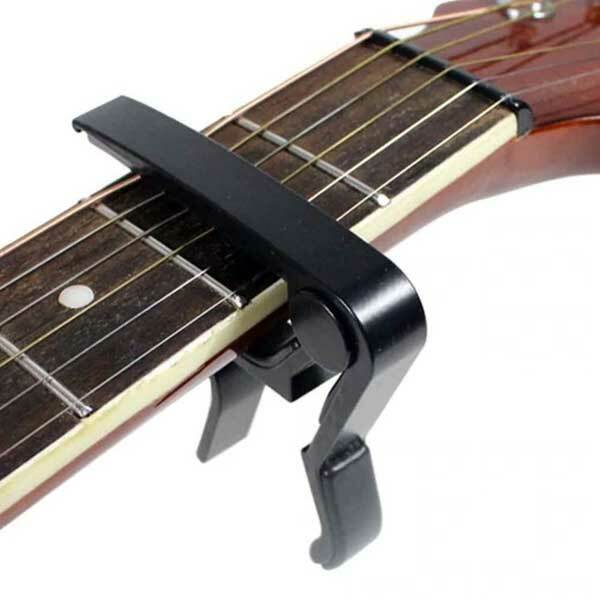 A guitar capo is an essential accessory every guitarist should have. Even if you don’t regularly play songs that make use of a capo, it’s an incredibly handy tool to have. In this guide, let’s look at what a guitar capo is, why it’s useful, and take a look at some of the best guitar capos available. I’ve included an FAQ section at the end of this guide to answer all your questions about capos. What is a Guitar Capo? 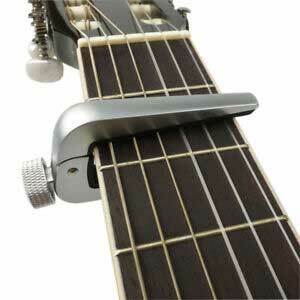 A guitar capo is a device that clamps on to your guitar’s neck to press against the strings. There are many different designs and ways capos clamp onto the guitar, but they all aim for the same goal. In the below photo, you can see that a capo lines up against a fret and holds all strings down on the guitar. The capo can be repositioned against almost any fret on the guitar. You could shift it all the way up to the 10th or 12th fret on some guitars, or you could place it anywhere down to the 1st fret. Some capos screw into place, others wrap around the guitar, and many grip the guitar like a clamp. Later in this guide, I’ll compare some of these types of capos so you can figure out which type is best for you. There are three main reasons why guitarists use a capo: singers, chords, and keys. Think of a capo as a way to shift up the guitar’s tuning without having to retune the strings. 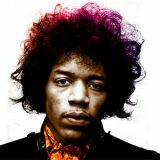 This allows a guitarist to instantly change the key of a song without having to use different chord shapes, or transpose any parts. The most common reason guitarists use a capo is when they’re accompanying a singer. Every singer will have a certain range they feel the most confident with. If they try to cover a song that’s too low for their range, it will strain them. A capo lets the guitarist quickly change the key while keeping the chords and parts exactly the same. Each song can be perfectly matched against the singer’s preferred range by adjusting the capo for each song. If you don’t accompany a singer, the other big benefit with a capo is with open chords. A capo lets a guitarist take the open chord shapes they already know, and play them anywhere across the neck. The orange bar represents the capo placed on the 2nd fret. When you play this chord, notice that we can use the exact same chord shape we used before. This time everything is moved up two frets because of the capo. Its the same shape as the E Major chord from before, but it will sound different. The chord has been shifted up two frets, which means it is now an F# Major chord (F# is two frets higher than E). There isn’t an open F# chord shape, so a capo lets you take all the open chord shapes you know and use them anywhere across the fretboard. While you’re highly unlikely to use a capo up that high, the video gives you a good idea how playing with a capo can change the vibe of a song. You might be surprised by how much a song can change just by moving a capo up or down one or two frets. Later in this guide, I’ll list a few songs that use capos, check some of those songs out to see how useful a capo can be. A capo’s job is to apply tension across the strings at just the right amount. Too little tension and you’ll hear horrible buzzing sounds when you pick the strings. Too much tension and your notes will bend out of tune. Think of what happens when you push your finger down on a string. If you apply too little pressure, the note buzzes. Too much pressure and the note starts to bend out of tune. It’s the exact same with capos. Some capos allow you to adjust the tension and dial in the perfect amount, while other capos have no way to adjust tension. If your guitar has a flat radius, get a flat capo. If it has a curved radius, go for a curved capo. It’s pretty simple but important to get right. Making sure your capo matches the radius of your guitar ensures that even tension is applied across the strings. Using a curved capo on a flat guitar (or vice versa) could result in buzzing strings or out of tune strings. Some capos take a fraction of a second to place on your guitar. You simply clamp them on and you’re ready to go. Other capos take longer and require fine adjustments to get into the right place. The right capo for you depends on your goals. If you’re a live performer and will be changing the capo position after every song, you probably want something quick and easy to use. Simply squeeze it to open and clamp it into place. If you’re a recording guitarist, you probably want something you can fine tune and adjust to get perfect results. It might take you longer to position the capo, but if it means you get better note stability, then it’s worth it. As you can see, there is an adjustment knob to dial in the perfect amount of tension for your needs. Even a small change in tension can bend a note in or out of tune, so if that’s important to you, choose a capo that allows you to adjust tension. The main point to remember is to pick a capo that suits your guitar. If you’re playing a classical guitar, you’ll probably need a different type of capo than what you would need for an electric guitar or a 12 string acoustic guitar. There are a lot of different capos out there today which can make it difficult to find the best guitar capo for you. Let’s look at some of the most popular guitar capos, how they work, and whether they’re right for you. 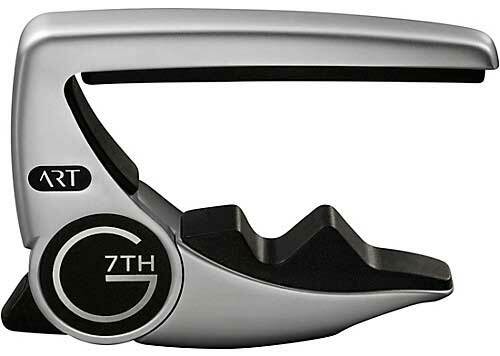 My personal pick for the best guitar capos has to go to the new G7th Performance 3. It’s a new model as of 2019 and overcomes an issue found in almost every other type of capo. Compared to other types of capos, the G7th capos are new. Shubb designed their C series capos in the 80s while G7th launched in 2004. While that doesn’t automatically make G7th capos better, it’s worth checking out how they’ve been improving capo technology. As you can see from the above photo, the G7th capo is sleek and simple in design. While it looks like a simple clamp-like capo, it actually gives you a lot of control over tension. To place the capo, you simply squeeze it into place. The capo locks into place and holds the tension you place onto the guitar. This might not give you the same precision you would get from an adjustment knob, but it’s enough for most needs. To release the capo, you push the level on the bottom. It’s quick and easy to move around your guitar and can be done one-handed. 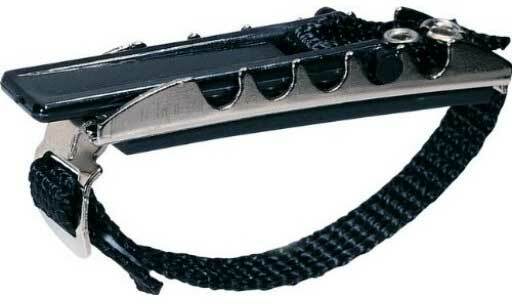 As the name suggests, this capo is perfect for live performers. You’re able to quickly change capo positions between songs while adjusting tension as needed. The G7th Performance 3 capo will adjust the radius to match your guitar. So instead of needing different models for acoustic and electric guitars, you can use one model across all of your guitars. That’s a huge advantage compared to other capos as even a slight mismatch of the radius can cause uneven tension and potential buzz noises. G7th do produce other types of capos, so if you prefer a different type, it’s worth comparing what G7th produce with other brands. Shubb produce some of the best guitar capos. The two most popular Shubb capos are the Shubb Deluxe and the Shubb C Series Standard. There’s very little difference between the Deluxe and Standard models. The Deluxe is made of stainless steel while the Standard is made of nickel-plated steel. As you can see from the above photo, the big benefit of Shubb’s capos is the adjustable flipping lever and roller. This allows you to adjust the tension against the strings and dial in the exact setting for your needs. The level allows you to easily flip it on or off, which makes this capo almost as quick and easy to use as a trigger-style capo. The left photo is the acoustic guitar model with a fairly flat radius. The right photo is the electric guitar model and has an obvious radius. Even if it doesn’t look like much of a difference, it is. 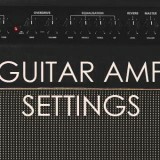 Some guitarists who buy the electric guitar model find that the radius is too much for their guitar and find the acoustic guitar model better suits them. If you’re looking for a quick and easy capo that gives you precision over tension, then I highly recommend a Shubb capo. Shubb also produces a popular partial capo that uses the same mechanism, the Shubb C7B. While I highly recommend the G7th and Shubb capos, they are expensive. If you’re only going to use a capo on occasion, you might prefer something a bit cheaper. Trigger-style guitar capos use a spring to clamp into place on your guitar. They’re easy to place on your guitar and quick and easy to move around. The downside of this type of capo is that you’re unable to adjust tension. 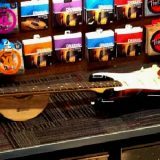 Depending on the tension across your strings, this could be a non-issue, or it could cause fret buzzing or out-of-tune notes. While I highly recommend any of the above capos, there are other type of capos that some guitarists prefer. Screw capos are clamp-like capos that use a screw to hold into position. The benefit of screw capos is that you’re able to precisely adjust the tension. The downside of this design is that it’s slow to remove and reposition. You need to adjust the screw to remove the capo, then tighten the screw again after placing it in the new position. This might be fine for recording purposes, but terrible for live performances. If you’re after precise adjustment over tension, I highly recommend one of the capos mentioned earlier such as the Planet Waves Tri-Action, the G7th or a Shubb. 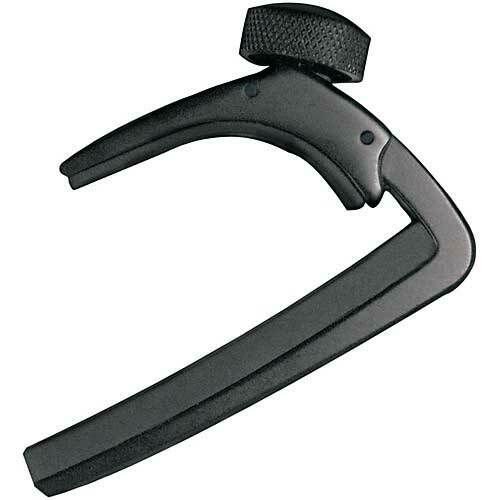 If you really want this type of capo, check out the Planet Waves NS here. Toggle capos are simple, very cheap and nasty (compared to other capos). An adjustable strap clips into one of the notches. I personally started off using this type of capo. It came as a freebie with a guitar magazine and showed me how useful a capo could be. I quickly discovered the downside of this type of capo – the gaps between the notches means you probably won’t find a suitable tension for your guitar. It’ll either be too tight or too loose. If you’re lucky, one of the notches will perfectly fit your guitar. Otherwise, you’ll quickly get frustrated. Check out this Dunlop Toggle Capo or Dunlop Elastic Capo for more details. Roller Capos are a bit of an oddball out of all the capo designs. If you need to reposition the capo regularly, then it may suit you. As the name suggests, this type of capo rolls into position. To move it between positions, you simply roll in up or down the neck. Check out the Glider GL-1 to see more about this type of capo. Yoke Capos are the last type of capo worth looking at. 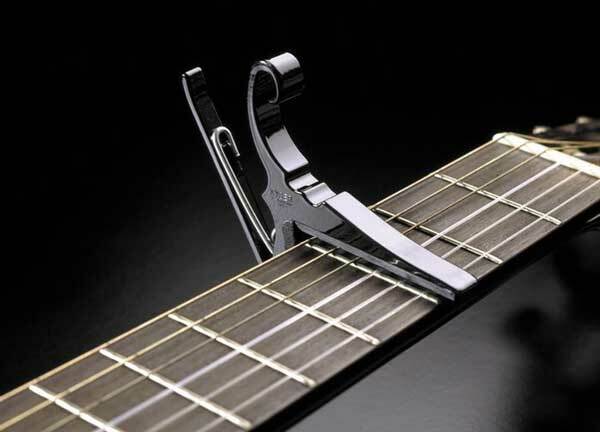 This type of capo clips over the neck, then an adjustable screw presses a bar into the strings from below the fretboard. What makes this type of capo unique is that it’s the only type of capo that applies pressure from directly behind the strings instead of the side of the fretboard. This means you get even tension across the strings and can precisely adjust the tension as you see fit. 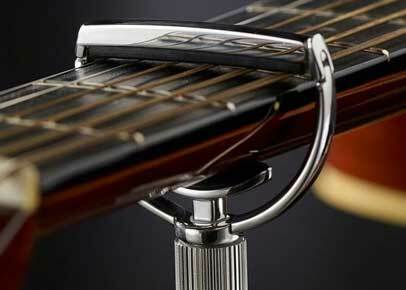 Check out the D’Addario Self-Centering Cradle Capo or the G7th Heritage for more details. Another type of capo that I haven’t covered in this guide is a partial capo. I’ll cover partial capos in a different guide as they’re a completely different type of tool compared to a typical capo. Not many guitarists use partial capos, but they can be incredibly useful for experimenting. There are countless songs that make use of a capo. While you can technically play any song with a capo, some songs were written with a capo in place. Some guitarists use capos all the time while other guitarists only use them on rare occasions. Depending on the music you listen to, you might find having a capo on hand becomes very handy. Position the capo properly. The position of your capo on the neck matters. If it’s too close to the fret, it may get in the way of your hand while playing. If it’s too far away from the fret, you might experience buzzing or other problems. Experiment with different tunings. Try an open tuning and place the capo in different positions. This is a great way to learn what keys you like the sound of and how shifting the capo can change the feel of what you’re playing. Be gentle when applying your capo. Some capos have hard edges which can easily scratch or damage your guitar if not handled properly. Take your time placing your capo on your guitar so you never have to deal with the horror of putting a big scratch in your neck’s finish. Do you need a capo? You don’t need a capo to play guitar. But depending on the style of music you play, not having a capo can significantly limit what you can play. Some songs are much easier to play with a capo and other songs can only be played with a capo. A metal guitarist may never need to touch a capo, while an acoustic guitarist who accompanies a singer may need a capo for every single song. Whether you need a capo or not depends on the music you play. Do guitar capos work with ukuleles? Most guitar capos will work on ukuleles. They’re big and bulky and may make it awkward to play properly, but they will work. If you’re a serious ukulele player, don’t use a guitar capo. It will look ridiculous on your ukulele. Buy a ukulele capo. How much do capos cost? 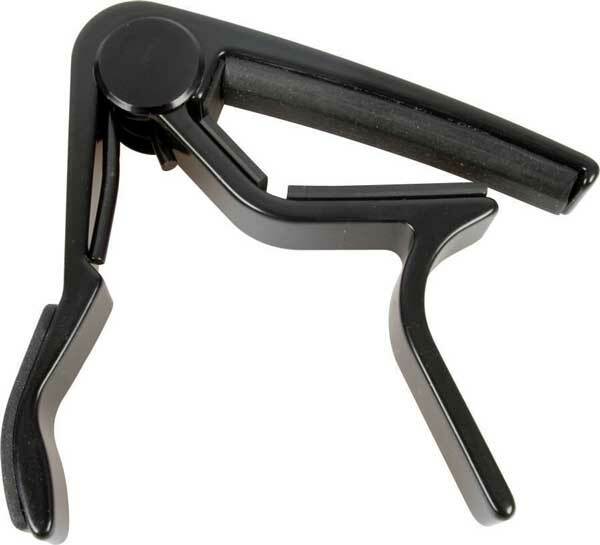 A guitar capo can cost anywhere from under $10 to well over $50. A good quality guitar capo that does a good job will cost around $20. As with any guitar gear, more expensive doesn’t always mean better quality. There are some $20 capos that do just as good a job as a $50 capo. As explained in this guide, the right capo for you depends on your needs. A $10 capo may be all that you need. Does using a capo make guitar easier? Yes, using a capo does make guitar easier to play in many different ways. 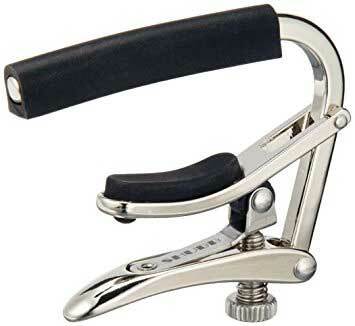 Not only can a capo reduce the pressure you need to apply with your fingers, but it helps guitarists who aren’t yet able to play barre chords. A capo lets you reuse basic open chords anywhere across the neck. This can make it easier for beginners to play songs without first needing to learn barre chords. Children learning open chords on guitar often find that learning the chord shapes with a capo speeds up the learning process. By reducing the pressure the child needs to apply on each string, less time is spent dealing with sore hands and more time is spent practicing chords. I highly recommend beginners buy a capo to assist in the learning process. Don’t use a capo as a crutch, but use it as a tool to speed up the learning process. No, a guitar capo is not necessary. They are necessary for certain songs, but to play guitar in general you don’t need one. Guitar capos allow you to take the open chord shapes you know and play them anywhere across the fretboard. They also allow you to easily transpose any song to match the preferred vocal range of a singer. While a capo may not be necessary to play guitar, it does make some things much easier. What can I use instead of a capo? If you really needed to, you could use a rubber band and a pencil as a capo. 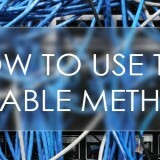 Place the pencil over the strings and use the rubber band to hold it in place. It’s not going to give you a very good result, but it might work. A proper capo can be bought for $10, so if you think you might have a use for one, just buy one or see if a friend will lend one to you. I guarantee it will do a far better job than a pencil and a rubber band. Can I use a capo on an electric guitar? Yes, you can definitely use a capo on an electric guitar. While capos are commonly used on acoustic guitars, they work perfectly fine on electric guitars. As mentioned earlier in this guide, make sure the capo you get matches the radius of your fretboard. There are some capos that have been designed for electric guitars. These capos use a lighter tension compared to capos designed for steel string acoustic guitars. Can you leave a capo on your guitar? While leaving a capo on your guitar may not hurt it, I recommend taking it off after a performance or practice session. A capo applies tension to the strings and if you’re not playing, there’s no need for that tension to be there. It’s possible that leaving a capo on the guitar for a long period of time may damage the capo. Grooves may develop in the capo’s rubber pad, which could cause issues over time. Whether this happens or not, just take your capo off of your guitar when you’re done playing. The other reason why I recommend taking the capo off after you finish playing is so you can give your strings a good clean. Wiping down the strings after each session is an easy way to prolong their life.